Gelatine has always been a healthy and safe food. European gelatine manufacturers stand for highest quality gelatine. This is evident in both the careful selection of premium raw materials as well as the multi-stage manufacturing process. Quality requirements for this process are laid down in national and international regulations – from the identification of which body parts of the animals may be used as raw materials to the physical parameters of processing all the way to the finished product. In 1999, in response to the Europe-wide BSE crisis, the EU Commission laid down tighter regulations for the manufacture, sale and purity of edible and pharmaceutical gelatine. However, long before these tighter measures were required by law, GME member companies had already implemented these EU criteria. Gelatine is a foodstuff that undergoes very careful examination as regards its safety, especially in light of BSE. The World Health Organization (WHO) and the European Commission for Health and Consumer Protection have confirmed gelatine’s safety based on international research findings. Most gelatine is made from pork skin; other raw materials are cattle hide and porcine and bovine bones. The raw materials used in gelatine manufacture come from registered slaughterhouses in which all animals are examined by a veterinarian. 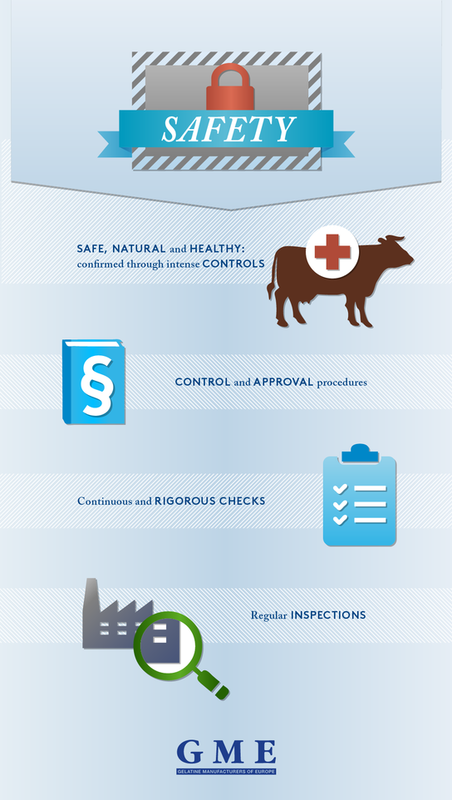 In addition, all European slaughterhouses carry out BSE tests on all cattle that are older than 30 months. However, none of the scientific examinations has ever found signs of a BSE infection. The meat of the animals is delivered to butcher’s shops, while the skins and bones are used for gelatine manufacture. The conventional slaughter, control and approval procedures guarantee that the raw materials used for gelatine only come from animals whose meat is suitable for human consumption. The raw materials are selected in compliance with statutory provisions. European legislation covers all stages of gelatine production, beginning with the selection of the raw materials right up to delivery. 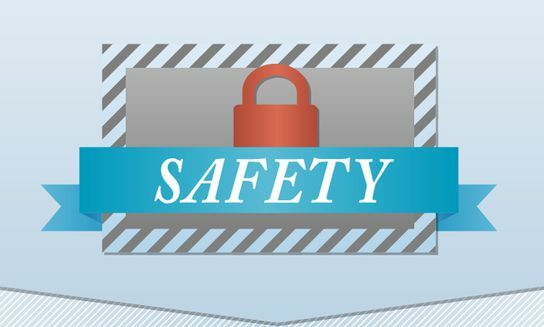 This means that all raw materials are subject to continuous and rigorous checks concerning safety and origin. Pharmaceutical gelatine must comply with the stringent requirements of the official pharmacopoeia. Edible gelatine must also meet these requirements and is additionally subject to food law. The gelatine industry is thus one of the best structured and controlled industrial sectors in all of Europe. To ensure absolute safety and uninterrupted traceability of the gelatine and collagen peptides manufactured for the food and pharmaceutical industry, not only are the strictly regulated requirements complied with, but numerous controls are also carried out. Regular inspections by the relevant authorities and constant monitoring of the entire production process ensure that the final consumer is always offered the best quality and the greatest safety. The raw materials used in the gelatine manufacturing process are by-products from the meat industry and come from registered slaughterhouses where all animals are examined before and after slaugther by an official veterinarian. The conventional slaughter, control and approval procedures guarantee that the raw materials used for gelatine manufacture only come from animals declared suitable for human consumption. The raw materials are selected in compliance with the statutory provisions. All raw materials are subject to continuous and rigorous checks concerning origin and safety. Edible gelatine must meet the requirements of the Food Hygiene Regulation (EC) No 853/2004 and is additionally subject to the European food regulations. Pharmaceutical gelatine in addition to these requirements comply also with the stringent requirements of the pharmacopoeias. The gelatine industry is thus one of the best structured and controlled industrial sectors in all of Europe. Constant monitoring of the entire production process and regular inspections by the relevant authorities ensure that the final consumer is always offered gelatin of the best quality and the greatest safety. Regulation (EC) No. 853/2004 lays down the general conditions for the production of edible gelatine and collagen peptide. It addresses all aspects, beginning with the raw materials right up to the delivery of the final product: origin, transport and storage of raw materials, manufacturing conditions, chemical requirements for gelatine and collagen peptide as well as packaging, storage and transport. Only raw materials from animals that are fit for human consumption and that have been approved by the respective veterinary authorities may be used; full documentation of their origin must also be available. The microbiological requirements for gelatine and collagen peptide are defined by Regulation (EC) No. 2073/2005. All these regulations set a very clear framework for the production of highest quality gelatine and collagen peptides. Additional requirements apply for gelatine that is used for pharmaceutical purposes; these are laid down in specific regulations. Thus, pharmaceutical gelatine and collagen peptides must not only comply with the prevailing requirements for edible gelatine and collagen peptides, but also the provisions for medicinal products according to Directive 2001/83/EC. Furthermore, gelatine and collagen peptides produced for the pharmaceutical industry from bovine raw materials must be certified for the European market by the EDQM (European Directorate for the Quality of Medicines & Healthcare) in compliance with the Note for Guidance of the European Medicines Agency (EMA/410/01 Rev. 3). Certification is only issued after the gelatine manufacturer has filed all documentation about the raw materials and about the manufacturing process and these have been reviewed by the EDQM. The European Pharmacopoeia contains further specific requirements for the production of pharmaceutical gelatine and collagen peptides as well as for the physical, chemical and microbiological quality characteristics of the finished product.